17 weeks. 1142 Mile. 146 hours of running. 95,135 calories. One 30 mile run and 9 runs of 20 miles or more. Average pace 7:41. 25 hours of strength training. 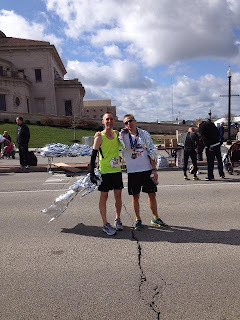 This sums up the work I put in for the 26.2 miles I ran at the 2013 Carmel Marathon on April 20th. Friday on my lunch hour I drove to the Monon Center in Carmel IN for packet pickup. Not much to say about this except that trying to squeeze it into a long lunch resulted in undue stress. Also this didn't allow me time to stick around and explore. But in the end I guess that's OK. Friday evening we headed out for some serious carb loading. With the taper and my efforts to load up on carbs over a 3 day period, I wasn't really hungry but I ate that pasta like a trooper anyway knowing that I would need it in about 12 hours. Sleep Friday night was spare. A sick dog and a wife finishing up her last semester for a Bachelors degree kept the house hopping until about 11:30. No problem, if you follow my training on dailymile you are aware that sleep almost always eludes me the night before a big training run so I am well adapted to running on less than adequate sleep. The race started at 7:30 AM in Carmel which is about a 45 minute drive from my home. I was out of bed and dressed by 5:00 AM eating my standard Cliff bar and banana pre-race breakfast. We had planned to leave at 5:45 AM. But getting 4 people out of the house proved too much and it was 6:00 AM before we were locking the front door. Stress level + 1. In mid-April you don't expect to have to deal with frozen car locks but that is just what we had to do. Stress level +2. I don't know how but my wife saved the day and got the car open as I was beginning to panic and we were on our way. Luckily no real traffic and so the stress level started to fall. We arrived and parked by 6:45. It was unusually cold. I had a race bag packed with gel, gloves, hat and compression shirt. My plan was shorts, singlet and arm sleeves. Near the start line, I got very nervous about the cold and swapped the arm sleeves for a compression shirt and added the hat and gloves. I gave the arm sleeves to my wife to put in the race bag, kissed her goodbye and made my way towards the front of the start corrals. I realized that my gels were still in the race bag and I panicked. Now my stress level absolutely went through the roof. I knew the course was offering no nutrition and I knew there was no way to meet my goal without some calories along the way. It took me a few minutes but I found my wife and got the gels. Lucky for me because she talked me out of the compression shirt and back into the arm sleeves. I put on a throw away sweat shirt to keep me warm until the start. I ended up very comfortable and would have been way too hot in the compression shirt. After the national anthem, a prayer, and a moment of silence for Boston the race started almost exactly at 7:30 AM. I love a race that starts on time! I made the Sign of the Cross, offered the race as a prayer and we were off! The course wound through the streets and neighborhoods of Carmel Indiana. With a total of 2000 participant between the marathon and half-marathon this is a mid-sized race on mostly nice wide roads especially in the beginning Although I never felt cramped, when the marathon and half-marathon split the was plenty of room to move. I was in a pack of 5 or 6 runners one of which was the lead female. As such we had a bike lead and that was a neat experience. At this point I knew my pace was about 7 seconds faster than planned. Since my goal pace already seemed like a bit of a stretch I worried that I wouldn't be able to sustain the faster pace throughout the race and that I would end up paying for it in the end. Against conventional wisdom I made the decision to go with it and hoped to hold on as long as possible. Around the half-way point the pack dropped to just me and one other guy and we kind of stuck together over the next 8 or nine miles. In short sentences with long pauses we talked about the race, running and life in general. I'll admit it made the time pass and really helped me stay on pace. I only met the guy that day and we spent a total of maybe an hour together. One great thing about running is I now consider him a friend. Not really sure that you can find that kind of thing many other places than in a marathon. There is not mot much else to say about "no man's land" as the part of the marathon between 13 and 20 miles is called. We hit the second half of the marathon, you know, mile 20 and I was still feeling very good. I decided to crank it up a bit. Miles 20 - 23 were my longest sustained miles at a pace of 6:30 or below. By mile 23 all of the " I still feel great" that I had was gone. Although the wheels didn't come off right away I started to feel the fatigue. My new friend still had quite a bit left in the tank and began quickly pulling away. He ended up finishing 2 minutes and 14 seconds ahead of me. My goal was 2:54:59. A time that would allow me to register for Boston 2014 on day one and nearly guaranteeing me a spot. I finished 40 seconds off but I am a realist. I know that finishing my second marathon in 2:55:39, 1st out of 83 in my age group and 13th out of 476 men (740 combined men and women) is no small feat. So even though I will now have to wait and see if there is a spot left in the coveted Boston field for me, I am pleased with my effort at the 2013 Carmel Marathon. You know you've trained well when you can race a marathon and finish with a fist pump. Me and my friend Garrett. I trained hard, tapered well, and carb loaded like a champ. In the race, I ran hard and gave it everything I had. My mantra for the training cycle and race was "If you're gonna die, die with your boots on." Everyday I got up laced up the boots and went to battle. On race day I didn't cower or hide; I charged straight ahead into the fight and won. If I had the training to do again and the race to run over I don't think that I would change anything. In the end my legs simply wouldn't produce the power in miles 24, 25, and 26 that I needed to sustain my pace. I believe that that strength will be built and improved in the training cycles to come. So the 2:54:59 marathon still eludes me. I guess that's why they run marathons in the fall and it looks like I have my work cut out for me this summer.